HF: This is an article where we can gradually add information about what happened to HK’s industry, manufacturing, mining , transport and other related areas such as shops and the retail trade during World War Two. As bits and pieces come in I’ll update the article and re-post it with the current date. Linked articles have been posted on the Group’s website unless otherwise stated. YL: When the Japanese attacked Shanghai in 1938, Yu moved to Hong Kong and set up Golden Dragon Metal Manufactory (金龍金屬製品廠) to manufacture screws. Together with fellow Shanghainese industrialists such as C.L. Hsu of Diaward Steel Works and John Yuen and China Can, Yu co-founded the Kiangsu Chekiang Residents Association in HK in 1939. Back home in Shanghai, Yung Zeng tried to protect its business through partnership with the German trading house of Melchers but after the outbreak of the Pacific War in 1941, production ceased as export routes were disrupted. Refused to collaborate with the Japanese invaders, Fang Yexian was killed by the Japanese in 1940.
Business in Shanghai resumed in 1945 but as the Civil War situation worsened in the mainland, S.S. Yu and his family moved to Hong Kong in 1948 where they established Yung Zeng Industrial (HK) Ltd with offices in Central Building in Central and factory in Sam Pak Tsin in Tsuen Wan. In addition to manufacturing menthol crystals, peppermint oil, camphor powder and essential oils, Yung Zeng also manufactured screws, fasteners and synthetic hair wigs. LT: Various series in Folder 10 of the Lindsay Ride Papers for the AWM collection regarding the BAAG contain much information about shipping as well as industries and economic activities in HK and S. Guangdong all meant for targeting by Allied bombers. They would provide good information on industrial activities in HK under Japanese Occupation. The BAAG started as a MI9 & MI19 operations in March 1942. It immediately combined with remnants of SOE operatives as well as evolved rapidly & extensively as an enemy intelligence collection operations. It functioned under the cover of elaborate Medical Services and Refugee Relief in South China. HF: http://gwulo.com/node/13968 (Gwulo is an easy way to find out about and access the following). The Elizabeth Ride Collection is a collection of material based on the life and work of Elizabeth’s father, Sir Lindsay Ride. It will be of most interest to people researching wartime Hong Kong, 1942-5, as it includes detailed records of the activity of the British Army Aid Group, the BAAG. Lawrence Tsui writes: The voluminous Lindsay Ride Private Papers are deposited at the Australian War Memorial. Copies and summaries of work done by Elizabeth Ride are placed at the Hong Kong Heritage Project, I understand. Gwulo.com has good coverage on this; including explanations of the Intelligence Summaries (KIS, WIS & KWIZ). The sections relevant to this site in the KWIZ would be II & III referring to general conditions under the Japanese Occupation. 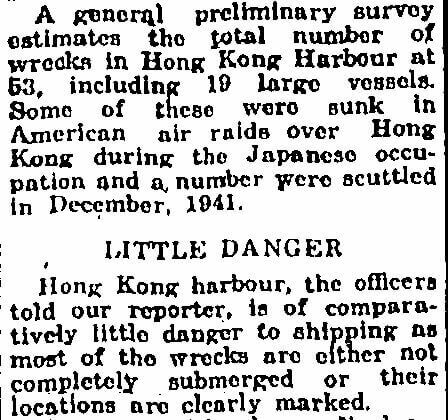 However, there were coverage under other headings as well, such as targeting & results of Allied Bombing of HK. The Agents reported on strategically important companies and docks etc, producing site plans, diagrams and maps. Allied bombings were extensive in late 1944 and early 45. I came across the Taikoo Docks (and other docks and factories) information in KWIZ 66/6 in Folder 10. YL: A native of Tat Ho village in Chaoyang prefecture (潮陽縣達濠鄉), Joy Fat’s founder Chan Ying-for (陳應科, 1907-1962) was born into a poor family and followed his father to Southeast Asia at an early age. He eventually ended up in Hong Kong where he set up the trading firm Joy Fat Hong (再發行) in the 1940s at 140 Wing Lok Street in Sheung Wan. He was involved with the Chiu Chow Chamber of Commerce from its early years and supported its efforts in building schools and clinics for fellow Chiuchow natives in HK. During the Sino-Japanese War in the late 1930s, he donated medical supplies to Chiuchow which was under attack by the Japanese and over the years, he contributed funds to purchase over 30 fishing vessels which were leased to the villagers from his native Tat Ho village and in return the lease payments funded the renovation and maintenance of his family ancestral hall. YL: After the outbreak of the Sino-Japanese War in 1937, he was also involved in refugee relief not only in New Territories where many refugees had flooded in from the mainland but along villages of the Kowloon Canton Railroad line in Guangdong province which was under attack.During the Japanese occupation, he was appointed leader of the Yuen Long district by the Japanese military administration and he died in 1944 while HK was still under Japanese control. After the War, Wing Yick& Co was no longer active. LT: On Jan 26 1945 [during an Allied air raid targeting various locations] Oil storage at No.11 Kowloon Godown was set on fire. YL: see York’s comment below our Bakilly article.The original Bakilly factory was located in 18-22 Shaukiwan Road (near the present day Taikoo Shing) when the firm was founded in 1918 until the late 1920s when it was relocated to a 10000 sq ft space in 203 King’s Road (now King’s Centre) as a result of the firm’s success. Sadly the firm’s factory was bombed first by the Japanese during the Battle of Hong Kong in 1941 and then by the Allied forces in April 1944. As a result the firm was devastated and had a difficult time recovering in the late 1940s, and only able to achieve less than 20 percent of its prewar sales. YL:In 1940, Chu Shek-lun (1909-1964) and fellow weaving mill owners formed the HK Weaving Mills Association (香港織布業同業商會) and he served as its inaugural vice chairman. Business was suspended during the Japanese occupation but resumed after the War. Hong Kong Memory Project: Wat Wai Chun’s younger sister had a lonely life during the Japanese rule. There were no adults around to take care of her. Neither were there any companion of her age. She lacked a good learning environment and a stable life…At the time when Hong Kong was severely bombed, a bomb dropped on a cowhide factory in Cheung Chau. YL: When Hong Kong was invaded by the Japanese, Fung Yuen Hon shut the shops and returned to Guangzhou. Before World War II broke out, Fung Yuen Hon had invested on insurance for exported goods. When one of the ships carrying goods bound from his drugstore was sunk during the war, he was compensated for the loss. As soon as Hong Kong was liberated after the war, Fung Yuen Hon was able to board a train and return to the Territory with the help of a relative who was a Kuomintang commander. During the Japanese occupation, Fung Sing-hong was a district councilor of the Western district alongside Wong Iu-suen of Wing Lee Wai (see article) and he was also a longtime director of the Fung’s Clansmen Association. As a firm, Wai Yuen Cheong was incorporated in 1954 and is still active. YL: In December 1941, HK fell to the Japanese and six months later in June 1942, representatives of the Japanese trading house Mitsui approached N.L. Lieu in HK asking him to consider returning to Shanghai to revive the family’s enterprises there. In November 1942, the Japanese seized the Peng Chau plant but after 10 months of negotiations with help from his brothers who had by then formed a joint venture with the Japanese in Shanghai, N.L. was allowed to re-open the Peng Chau plant in August 1943, although production for the remainder of the War was limited due to shortage of raw materials and fuel with only 11 workers working part time. PC: writes about the company on 10 Dec 1941. The following reports come from the War Diary of HMS Cicala. 0630 Orders were received to destroy the Hume Pipe Factory on Castle Peak Road north of Rambler Channel and Chinese factories to the east of that target as far as the bridge west of Tsin Wan Village , then, to delay any advance of the enemy along Castle Peak Road. 0715 Opened fire on the Hume Pipe Factory with 6” HE. This was a most unsatisfactory target at close range as it was a long low building partially obscured by a high bank, however many hits were obtained , and then the two corrugated iron sheds in front of the factory were shelled and destroyed. YL: When Canton was occupied by the Japanese in 1938, he moved to Hong Kong with six of his technicians and founded IPCO. The company first set up a factory on Lau Li Street, Causeway Bay which had an area of more than 8,000 sq. ft.
During the Second World War, two branch factories were set up, one on Kwong Wah Street and the other in 141 To Kwa Wan Road, Kowloon. IPCO manufactured ship paint, building paint, synthetic enamel, varnish, lithographic and letterpress printing ink. YL:When the Japanese occupied Singapore in 1941, Lea Hin came under Japanese military control. After the War, business resumed and in addition to kerosene lamps, Lea Hin began importing kerosene stoves from America and marketed them under the “Butterfly” brand.When the Communists took over Shanghai in 1949, Lea Hin lost its source of supply for kerosene lamps and as a result, the firm set up its ownmetal factory in Singapore at the junction of Alexandra Road and LengKee Road to manufacture lamps. It later ventured into the production of steel casement windows, marketed under the “Star” brand, and supplied them to Housing Development Board projects that required window grilles, roller shutters and aluminum sliding windows. YL: During the Second World War, two branch factories were set up, one on Kwong Wah Street and the other in 141 To Kwa Wan Road, Kowloon. IPCO manufactured ship paint, building paint, synthetic enamel, varnish, lithographic and letterpress printing ink. YL: When the Japanese occupied Canton in 1938, Po Chai relocated with the KMT regime to the Southwest where branches were established in cities such as Kunming, Chunking and Kweilin. When the War was over in 1945, Chan returned to Canton and then moved to HK in 1949 where he extended Lemonin’s markets to Southeast Asia and beyond. In 1954, Chan Shiu-chuen visited Phnom Penh with plans to open a branch there. LT: There was some mention of mininghan done during the Japanese Occupation, especially the Lin Ma Hang Mine, in the intelligence reports of the British Army Aid Group (BAAG) – see the Sir Lindsay Ride Private Papers. TM: In 1940, the South China Iron Smelters Co. Ltd. took over the mine and started to excavate commercial quantities of ore in an open cut quarry using hand operated tools. Production reached up to 100 tons a day with the concentrate, carried to the coast using mule and horses and shipped to the Green Island Cement Company. The mining company had plans to build a blast furnace on the sea-front to produce its own steel. However, the Second World War interrupted production. During the Japanese occupation of the territory, from 1942 to 1945, the mine was operated sporadically by the Japanese who shipped the raw ore to Japan to support war production. At this time the mine employed about 1,500 workers (it is not clear if these were paid or forced labour as adopted in many Japanese captured mines) and as there was still no mechanical transport, horses and donkeys were used to carry the ore down the hill to the dockside. On 26 Dec 1941, the day after the Hong Kong Government surrendered to the Japanese,the Japanese authorities decreed the military yen to be the legal tender of Hong Kong. [this conflicts with another source which states this did not happen until 1942 – Does anyone know the actual date?] The use of the Hong Kong dollar was outlawed and a deadline was set for exchanging these into the military yen. [Does anyone know the date of this deadline?] When the military yen was first introduced on 26 December 1941, the exchange rate between the Hong Kong dollar and the military yen was 2 to 1. However, by October 1942, the rate was changed to 4 to 1. Fung Chi Ming: The English language (Japanese) newspapers published during wartime, known as Hongkong News, is only available in microfilm, deposited at the Hong Kong University Library (possibly also in the HK Central Library, Causeway Road). In the HK public libraries website, there is a limited amount of digitalized newspapers but they do not include the Hongkong News. HF: Sep 1942 ” At present there are four morning and one evening newspapers in Hong Kong. They are: daily newspapers such as the Xiangiang, the Xingdao, the Huaqiao, and the Dongya Evening Post. These are all published in Chinese. In addition, there is the Hong Kong Daily published in Japanese, and the Hong Kong News in English. The newspapers come out daily in a single sheet, and are sold at 5 sen Military Currency each.” (quoted form the HK Broadcasting Office in Faure p225) I do not know if the Japanese or Chinees language newspapers can be seen in Hong Kong, nor if so in what form. ADW: Parts of the Terminal were old. One of the tanks was built around 1936, of riveted construction rather than welded, and it was badly damaged by Japanese bombing during the war. It was taken apart, rivet by rivet and plate by plate, then the plates were beaten back to semi-flat using sledge hammers (the marks were clearly visible on the plates) and re-riveted. The rebuilt tank only leaked a little so it was used for lube base stock because lighter products such as diesel would have spurted little fountains all over it. LT: On 26th Jan 1945 [during an Allied air raid targeting several locations] the Texaco Oil installation at Tsuen Wan was bombed and caught fire. Oil storage at No.11 Kowloon Godown was set on fire. Aberdeen – during the occupation the Chinese name for Aberdeen, ‘Hong Kong Tsai’ was changed into the Japanese, ‘Yuan Hong Kong’ (元香港), meaning ‘The Origin of Hong Kong’. The re-naming of streets into Japanese apparently took place on 1 Apr 1942. YL: During the Japanese occupation, Li resumed his career as a property broker. At the time landlords were liquidating properties at bargain prices to get by and as a scion of the Li family, Shiu-chung was connected to many of the sellers. He also befriended many of the buyers including the Chiuchow merchant Liu Po-shan (廖寶珊, 1900-1961), who became one of the biggest landlords in Western district with the help of Li and later founded the Liu Chong Hing Bank (now Chong Hing Bank). HF: The numbers in the above newspaper article differ from the following. “[Post War] Almost none of the navigation aids remained, and the fairways ad wharves were clogged with 13 major and 95 minor wrecks.” (Ward). And again from an information board at the Hong Kong Maritime Museum which states, “[the liberation of Hong Kong] found a devastated town, wrecked dockyards and 230 shipwrecks strewn across the harbour”. It continues “all wrecks were cleared by Sept 1947”. 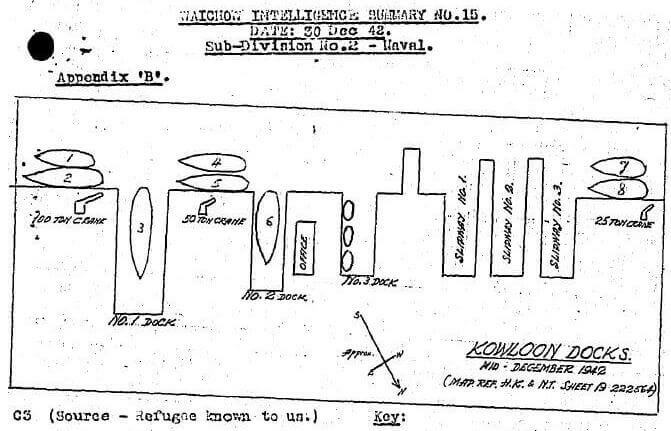 LT: Various BAAG agents were actively observing all enemy shipping in HK and providing details of Japanese ships as well as the various dockyards, making detailed drawings of both. (See Lindsay Ride Papers at the AWM Series 10 Folder 16). LT: The BAAG’ had a strong interest in collecting intelligence on Japanese shipping into & out of Hong Kong during the Occupation. In the Ride Papers (Ref: AWM Series 2 Folder 32) there were some reports of a plan to set up an Observation Post for shipping at Lamma Island circa August 1944. Agent 530 Sham Yung-hung, formerly HKRNVR), whose family were from Lamma Is, was sent back to conduct feasibility studies. The plan was for Sham to bring back a BAAG OP Team and operate a Force 136 radio set on a moving junk steered by his family off Lamma. There were reportedly no enemy troops or Red Guerrillas on Lamma. Japanese troops from Aberdeen visited from time-to-time only. Originally, the BAAG tried to set up a Shipping OP at Sunset Peak on Lantau. The plan was disallowed by the Nationalist Government on account of the needed co-operation for protection by the local Red Guerrillas. Then the Nationalist Government allowed a BAAG OP to be set up at Tzatleunshan, Daipeng Bay. Upon arrival in the Autumn of 1943, the OP Team was captured by the local Red Guerrillas and held for ransom for some 4 months. This Lamma Island OP would be free from such complications. I’m not clear why the Lamma Operation was not implemented. LT: On 16th Jan 1945 over 300 Allied Aircraft raided HK lasting from 0900 to 1800hrs. Five vessels in the harbor were severely damaged and half sunk. HF: BAAG WIS#15 30th December 1942. In October 1942 the Army handed over Bailey’s Shipyard to the Osaka Iron Works Company. LT: BAAG Ref: Kwiz 86/5 Feb 1945 (Lindsay Ride Collection AWM Series 10 Folder 30). BAAG was active in collecting information, including sketches of ships and site plans of this dockyard. Details of work done, work force and problems encountered were reported. LT: On 16th Jan 1945 over 300 Allied Aircraft raided HK lasting from 0900 to 1800hrs. During this raid the Cosmopolitan Dock at the end of Boundary Street was damaged. On 26th Jan 1945 during air raids by Allied aircraft [targeting various locations] the Cosmopolitan Shipyard was damaged. LT: BAAG Ref: Kwiz 86/5 Feb 1945 (Lindsay Ride Collection AWM Series 10 Folder 30). Renamed Dainichi. BAAG was active in collecting information, including sketches of ships and site plans of this shipyard. Details of work done, work force and problems encountered were reported. HF: “The bombed Jinsham steamer returned to duty after repairs at the Kowloon Dockyard (Whampoa). (Cheng 2006) When was the ship bombed and when did it return to duty? HF: BAAG WIS#15 30th December 1942. In October 1942 the Army handed over Kowloon Docks to the Osaka Iron Works Company. Oct 25, 1942 Report of an American bombing raid (CATF) 12 B-25s and 7 P-40s, on Kowloon Docks. HF: BAAG KWIZ#76 24th November 1944 Two small generators remain working in the China, Light & Power Co. Station (22365684). Electricty is supplied only to Kowloon Docks and Green Island Cement Works, each of which receives 3 days’ power in the week. This power station has been allotted 47 tons of coal from Formosa, and on 5th November had about 2,000 tons of coal in stock. LT: On 16th Jan 1945 over 300 Allied Aircraft raided lasting from 0900 to 1800hrs. Sixteen ships were sunk or damaged, including one sunk at Kowloon Dock. 5th Apri 1945 (FEAF) B-24s bomb Kowloon Docks. 8th April 1945 (FEAF) B-24s bomb Kowloon Docks. LT: On 16th Jan 1945 over 300 Allied Aircraft raided HK lasting from 0900 to 1800hrs. Sixteen ships were sunk or damaged, including: one sunk and one damaged at the Naval Dock. On 21st Jan 1945 air raids were conducted by some 20 Allied Aircraft which included damaging the Naval Dock, including electrical workshops & godowns. HF: BAAG WIS#15 30th December 1942. In October 1942 Mitsui Bussan Kaisha took over Taikoo Dock from the HK Government. LT says: Folder 10 Series 16 of the Lindsay Ride Papers of the AWM collection regarding the BAAG contain a couple of site plans of Taikoo Docks circa Aug & Sep 1944. These were supplied by BAAG Agents as intelligence for targeting by US Bombers. I should think bombing took place immediately after. The Taikoo Docks could have been bombed more than once though. Can anyone provide the exact date of the above raid. And any further information about locations bombed by either Japanese or Allied forces during WW2. LT: On 16th Jan 1945 over 300 Allied Aircraft raided HK lasting from 0900 to 1800hrs. Sixteen ships were sunk or damaged, including six damaged at Taikoo Docks. HF: “The Taishan steamer, sunk by British forces, was recovered from the waters of Chaiwan and brought for repairs at the Mitsui Dockyard (Taikoo Dockyard). (Cheng 2006). What date was this ship sunk? LT: On 16th Jan 1945 over 300 Allied Aircraft raided HK lasting from 0900 to 1800hrs. Sixteen ships were sunk or damaged, including two destroyed in Tsuen Wan Shipyard. LT: BAAG Ref: Kwiz 86/5 Feb 1945 (Lindsay Ride Collection AWM Series 10 Folder 30). BAAG was active in collecting information, including sketches of ships and site plans of this shipyard. Details of work done, work force and problems encountered were reported. Hok Un Power station shortly after the Japanese surrender. 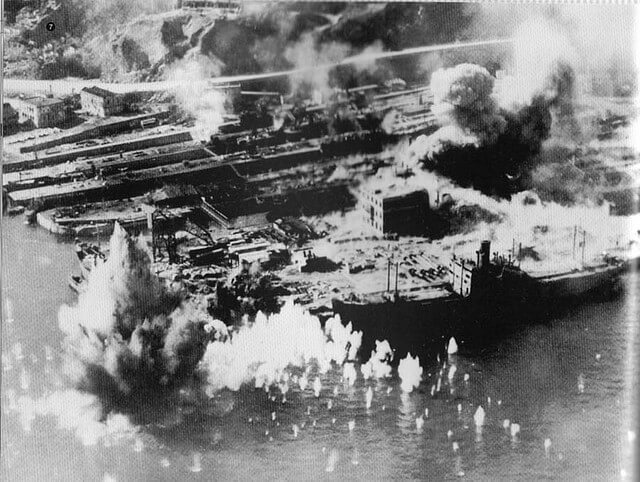 Oct 25 1942 (CATF) 12 B-25s and 7 P-40s, bomb the North Point power plant which provides electricity for the shipyards. This article was first posted on 9th August 2014 and has been updated many times since then. Folder 10 Series 16 of the Lindsay Ride Papers fo the AWM collection regarding the BAAG contain a couple of site plans of Taikoo Docks circa Aug & Sep 1944. These were supplied by BAAG Agents as intelligence for targeting by US Bombers. I should think bombing took place immediately after. The Taikoo Docks could have been bombed more than once though. Various series in Folder 10 also contain much information about shipping as well as industries and economic activities in HK and S. Guangdong all meant for targeting by Allied bombers. They would provide good information on industrial activities in HK under Japanese Occupation. Thanks Lawrence. I have added this information to the article “HK Industry during World War Two”. I am not familiar with the Lindsay Ride Papers nor with the AWM collection. Is the latter Australian War Memorial? For the benefit of myself and others who do not about these sources I wonder if you could provide a little more information. Allow me to point out that the BAAG is a regular (not irregular) force under GHQ India, New Delhi, through the Military Attache at the British Embassy in Chungking, China. I have a letter from the HK Government Secretariat in hand, written in 1962, clarifying this status of the BAAG with the UK Government. The voluminous Lindsay Ride Private Papers are deposited at the Australian War Memorial. Copies and summaries of work done by Elizabeth Ride are placed at the Hong Kong Heritage Project, I understand. Gwulo.com has good coverage on this; including explanations of the Intelligence Summaries (KIS, WIS & KWIZ). The sections relevant to this site in the KWIZ would be II & III referring to general conditions under the Japanese Occupation. 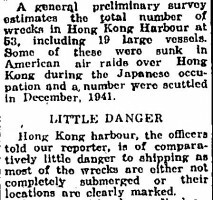 However, there were coverage under other headings as well, such as targeting & results of Allied Bombing of HK. The Agents reported on strategically important companies and docks etc, producing site plans, diagrams and maps. Allied bombings were extensive in late 1944 and early 45. I came across the Taikoo Docks (and other docks and factories) information in KWIZ 66/6 in Folder 10. I also read about a small ship building yard as well as a certain machinery factory at Lamma therein. Very useful information regarding BAAG and the Lindsay Ride Papers. I have added this in a new section General Information in the main article and added the link to the Australian War Memorial http://www.awm.gov.au under Sources. On 15th Jan 1945, two Allied aircraft crashed into the harbour – one pilot baled out and taken prisoner; the other who crashed outside Holt’s Wharf (today’s New World Centre) was killed. On 16th Jan, over 300 Allied Aircraft raided lasting from 0900 to 1800hrs. Sixteen ships were sunk or damaged, including: one sunk and one damaged at the Naval Dock; six damaged at Taikoo Docks; one sunk at Kowloon Dock; two destroyed in Tsun Wan Shipyard; five vessels in the harbor severely damaged, half sunk; as well as a coupled of large armed junks off Kaitak & Mataukok. The Cosmopolitan Dock at the end of Boundary Street was also damaged. On 17th, some ten aircraft were shot down in Hong Kong; two pilots taken prisoners. On 21st Jan, air raids were conducted by some 20 Allied Aircraft over Wan Chai, destroying quite a few patrol boats as well as damaging the Naval Dock, including electrical workshops & godowns; the Luard Road, Stuart Road, Johnston Road & Tin Lok Lane area, including the Japanese Military entertainment area in Wan Chai, were severely hit with thousands of casualties & kills including many Japanese & Chinese. On 26th Jan, a transport ships at Stonecutter Island as well as the Cosmopolitan Shipyard were damaged. During these raids, Kaitak airport was also attacked, severely damaging the runway as well as destroying four aircrafts. Oil installation at Tsuen Wan – Texaco was bombed and caught fire. Oil storage at No.11 Kowloon Godown was set on fire. More details of the situations, including sketches of ships and site plans of dockyards such as the Cosmopolitan, Kwong Heep Lung (renamed Dainichi) Shipyard, and Wing On Shing Shipyard were included.. Details of work done, work forces and problems encountered at each were reported. There are many of such reports in the BAAG papers. The KWIZ intelligence reports in the later half of the War were particularly studious in describing economic situations as well as companies & industries, because of increased demand for intelligence in support of the Economic Warfare being conducted. Perhaps someone would be interested in reading them to glean information on industries & economic conditions during the Japanese Occupation. Unfortunately, this is not the primary focus of my research; mine is more the cloak & dagger aspects. Originally, the BAAG tried to set up a Shipping OP at the Sunset Peak on Lantau. The plan was disallowed by the Nationalist Government on account of the needed co-operation for protection by the local Red Guerrillas. Then the Nationalist Government allowed a BAAG OP to be set up at Tzatleunshan, Daipeng Bay. Upon arrival in the Autumn of 1943, the OP Team was captured by the local Red Guerrillas and held for ransom for some 4 months. This Lamma Is OP would be free from such complication. I’m not clear why the Lamma Operation was not implemented. Other raids occurred, the earliest resulting in shipping loss being 1 December 1943 when Teiren Maru ex Gouveneur General A Varenne was sunk at Taikoo Dockyard by 14 AF B25s..